Boston PRK is performed by Dr Ernest Kornmehl, a refractive surgery specialist. On this webpage, Dr Kornmehl provides information about PRK refractive surgery and how it has improved the vision of many of his patients. PRK or Photo-Refractive Keratectomy treats refractive errors by removing tissue from the surface of the cornea. First, your eye is numbed using a topical eye drop anesthesia. Then, Dr. Kornmehl removes the epithelium, a thin layer of protective skin that covers the cornea. This may be done with either a blade, a brush or even the excimer laser. During the actual procedure, the patient stares at a fixation light. In less than a minute, the laser removes the proper amount of tissue while it reshapes the surface of the cornea. After PRK, a bandage lens is placed on the cornea for 3 – 5 days. Because the epithelium was removed, patients may experience blurry vision for three to five days and a mild to moderate amount of discomfort until the epithelium heals and covers the treated area. Eye drops, and narcotics are effective in reducing this post-operative discomfort. Final visual results may be fully realized anywhere from several days to a few months or more as the surface heals in accordance to each individual’s healing tendencies. PRK is most often used to treat low to high amounts of nearsightedness and astigmatism. The LASIK eye procedure involves creating a thin flap of tissue in the cornea, folding it back and sculpting the underlying tissue with a laser. During PRK, instead of making a flap in the corneal tissue, the top layer of tissue is simply removed. After surgery, it regenerates on its own. PRK is usually recommended for individuals whose corneas are too thin to withstand the creation of a corneal flap. It can also be a better option than LASIK for individuals who have active jobs, such as athletes (boxers, wrestlers, etc. ), who could risk dislodging the healing corneal flap after LASIK, causing a complication. PRK candidates should be at least 18 years old and have a steady eye prescription that has not changed within the past year. The patient’s corneas should be healthy and their overall eye health strong. Suitable candidates should have reasonable expectations of what the procedure can and cannot achieve. First, the eye is numbed with anesthetic drops. Then, the surface, or epithelial, cells of the cornea are removed with a brush, blade or laser. The underlying corneal tissue is sculpted to improve the refractive error. After surgery, a bandage contact lens is placed over the eye to protect it as it heals. What is the recovery like after PRK? Recovering from PRK takes longer than recovering from LASIK because the epithelial tissue has to heal. The bandage contact lens should be worn for about four to five days during the initial healing process. Vision may be blurry as the eye heals, and special eyedrops should be used during recovery. Most patients are 20/40 four days after surgery but it can take up to 30 days for the patients to see final visual results. One of the primary benefits of PRK is that it eliminates the risk of flap-related complications. 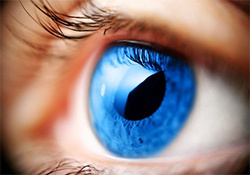 Although complications are rare after LASIK, they are possible. With PRK, there is no concern about direct trauma to the eye that could dislodge or disturb the cornea. PRK risks include unpredictable healing of the cornea, complications of scarring, and infection. 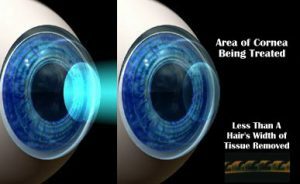 What laser vision correction procedure is right for me? The best way to determine the procedure that is the better fit for you is to meet with Dr. Kornmehl to discuss your options. You may be a candidate for one or both, but you won’t know until you consult with Dr. Kornmehl. During a laser vision correction consultation, your eyes will be thoroughly examined to look for any problems. Your visual acuity will be tested to determine whether it has changed recently and how high your refractive error is. 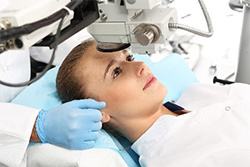 Your corneal surface will also be measured and mapped to determine whether you are a candidate for PRK or LASIK; if you are, the information will be used to help program the laser used during surgery. To schedule a consultation to discuss laser vision correction with Dr. Kornmehl, please call or email our practice today.